- Lowbrow Customs designed, road-tested and approved! Ditch that belt and go with a traditional 530 rear drive chain setup on your 1994 - 2003 Harley-Davidson 883 Sportster. This chain conversion kit keeps the same gearing ratio as your stock drive belt setup on a 883 Sportster. 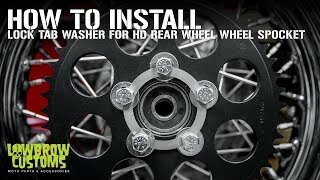 Remove the stock pulleys and simply install the front sprocket, the spacer and rear sprocket with the included proper length chrome plated hardware. 530 chain not included, supply your own or choose one from the 530 Drive Chains here at Lowbrow and we will send it on it's way. The transmission sprocket, rear sprocket, sprocket spacer and the included hardware are all Made in the USA to the highest quality available. Beware cheap imported imitations, ours are engineered and manufactured in the USA, heavily road-tested and built to last. The front sprocket is high quality nickel plated Chromoly steel, and the rear sprocket is 7075-T6 certified aero space grade aluminum for long life and light weight. This kit is designed to match stock gearing for 1994-2003 883 Sportsters. The countershaft (front) sprocket is 22 teeth, and the rear sprocket is 48 teeth, for a 2.18:1 gearing ratio. This means that the countershaft sprocket rotates 2.18 times to spin the rear sprocket one full revolution. The less times the countershaft sprocket has to rotate, the taller the gearing, meaning less power off the line but better high-speed cruising. The 1994-1999 rear sprocket has a 1.985 inch diameter center hole and the 2000-2003 rear sprocket has a 2.214 inch diameter hole to properly fit the stock 1200 Sportster rear wheel. NOTES: These are made for use in a stock Sportster frame or a frame or hardtail which uses stock spacing (such as hardtails which use the stock rear wheel assembly, brake, and axle spacers). If the frame you are using is a different axle plate spacing (width) or you are using a non-stock wheel this may affect the rear sprocket alignment. This is for use with a stock width wheel, and is not for a wide tire conversion. Because of tight clearance when using stock muffler mount or stock passenger peg mounts do not use an O-ring chain because the additional width may cause chain to wear at these components on deceleration. I haven’t ridden with it yet but seems like a quality product. I has to change the spacer on my 94 883. I found this info that helped my find what I needed : Incase anyone else runs into this problem with pre-1994 belt drives the part that needs changed is the spacer behind the Trans sprocket. When I got home from work last night I measured it and found it is 0.849" which is H-D part #33334-85. The spacer I need is 0.600" and is H-D part #33344-94. This will slide the sprocket in enough to thread the nut on and align it with the rear sprocket. It appears early belt drives had the wider spacer and a pulley with a Spline Width of only 0.5" as opposed to the 0.766" of the 94+ pulleys. the oil seal for pre-94 main-shafts that goes with spacer #33334-85 is part #12050. The oil seal that goes with spacer #33344-94 is part #12067A. Also both use the same quad oil seal, part#11165. 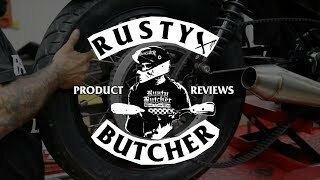 I wanted a chain instead of a belt for my sportster, and I found a lowbrow chain conversion kit while I was looking for something. Installation is very easy. Anyone can. It is a very good kit. I highly recommend! What is the offset of the trans sprocket?